A marriage of talents and a meeting of minds. Zacherle Wines is an outlet for winemakers Nile Zacherle (winemaker at David Arthur Vineyards and Montagna) and Whitney Fisher Zacherle (winemaker at Fisher Vineyards) to collaborate stylistically and artistically to create wines that pay homage to origin, yet are influenced by the couple’s personalities and passion. 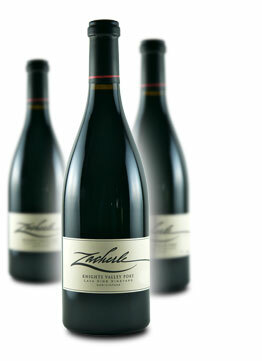 In every bottle of Zacherle wine is a devotion to their craft. They combine old world winegrowing techniques with new world fruit, handcrafted from vineyard to bottle with carefully honed skills acquired at home and abroad. Zacherle Wines are created from grapes that are locally sourced and farmed sustainably, biodynamically, and organically.